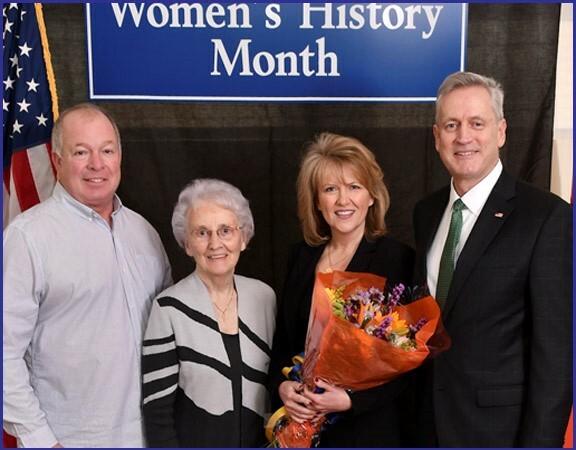 At the 20th Annual Nassau County Legislature’s “Women of Distinction Awards”, Presiding Officer Richard J. Nicolello honored May O’Boyle Deegan for her tireless leadership in the community and county and for her many years of dedicated service in promoting and preserving Irish culture and heritage. May, a first-generation Irish-American, born and raised in Queens, New York, moved to Garden City Park in 1991 with her husband Tommy and daughter Melanie. She was President of the Irish American Society of Nassau, Suffolk and Queens, where she ably led one of the area’s foremost Irish-American organizations. May was a dynamic and dedicated leader, and also served as Grand Marshall of the St. Patrick’s Day parade. May has also run numerous Irish dancing competitions for various organizations in the community and is the proud owner of a small business, Feis Head, where she sells accessories for Irish dance competitions. May was a Girl Scout leader in Garden City Park and has taught Religious Education at both Notre Dame and Holy Spirit. She is also a member of the Holy Spirit Pastoral Council, festival committee, website manager and a Eucharistic Minister. Legislator Nicolello stated: “May is a selfless leader who consistently gives of her time and talent to serve. It is my great privilege to honor May as a true Woman of Distinction and proud daughter of Ireland. Shown in photo above, from left to right are: Thomas Deegan, Madge O'Boyle, Honoree May O'Boyle-Deegan, and Presiding Officer Nicolello.